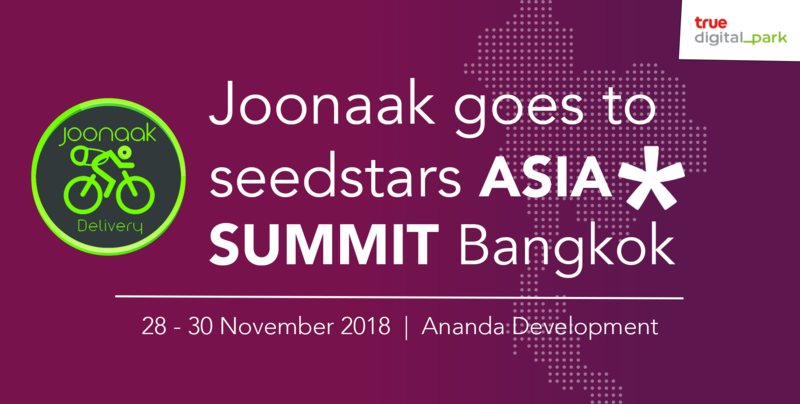 Joonaak Represents Cambodia at Seedstars Asia Summit 2018! Geeks in Cambodia is excited to announce that Cambodian delivery provider Joonaak is among the finalists for the Seedstars World competition, and will be going to Bangkok for the Asia Summit, before representing the kingdom at the summit in Switzerland in April 2019. The entrepreneurship forum in Bangkok aims to bridge the gap between ecosystems and connect Asian tech entrepreneurs, investors, corporations, governments and other stakeholders of the startup ecosystem to promote tech entrepreneurship as a way to impact people. Seedstars World (SSW), the largest startup competition for emerging markets and fast-growing startup scenes, is hostingthe annual Seedstars Asia Summit at Ananda Development for the second time. This year’s edition is organized in partnership with True Digital Park in Bangkok, Thailand, from November 28th to 30th. The event is invite-only but if you are enthusiastic about technology and entrepreneurship, you can request a ticket here! The Seedstars Asia Summit will kick-off with a bootcamp where more than 25 participating startups will receive a mix of theoretical and practical content, with input provided by the Seedstars investment team on growth models and acquisition channels. All participant startups will have the chance to choose the most relevant mentors to their needs before an Investor Forum in the afternoon, with one-on-one meetings between investors and entrepreneurs. Some of the investors include Sequoia Capital, Jungle Ventures, Digital Ventures, 500 and Golden Gate Ventures. The Summit’s climax will be the Conference on the 30th of November, featuring the startup pitches, keynotes with top-notch entrepreneurs, and think tank style workshops. The topics under discussion include: how corporations can collaborate with startups, the investment landscape in Asia and Smart Cities. “In 2017, we managed to bring together more than 300 attendees, between entrepreneurs, corporates, investors, mentors, government authorities and startup enthusiasts. We organized around 175 meetings between startups, investors and mentors and we felt overwhelmed by the positive feedback we had from all participants. This year we aim to grow and offer a unique disruptive hands-on experience to even more participants!”, says Rosie Keller, Regional Manager for Asia at Seedstars. The Summit is part of the Seedstars Global Programme and we expect it to be a unique opportunity to exchange experiences, network and know more about what foreign startups expect of the region, so don’t miss it! For more information you can visit their website HERE.